Among those households, a number will want to own more precious metals beyond the Emergency stash -- for increased protection against monetary devaluation/economic crisis/asset price bubbles. But they don't want exposure to the increased risks involved with storing greater amounts of bullion. In terms of storage options, the HAA holds any precious metals you buy in your name. This is "allocated" storage -- no one else has claim to that same bullion. This differs from "unallocated" solutions where buyers have a fractional claim on a pool of bullion. When using a storage company, definitely choose allocated solutions over unallocated. They also offer a "worry-free" automated purchasing program that lets you create a set-it-and-forget it plan for accumulating bullion over time. This lets you tap the power of dollar-cost-averaging without having to actively manage the process. And should you decide at any point you want your vaulted bullion sent to you, the HAA will ship it upon demand. Those who wish to bet on the price of precious metals rising or falling can trade within the growing number of ETFs and ETNs tied to the price of gold and silver. ETFs/ETNs are securities that trade on the financial markets much like a stock does. They are essentially funds that have exposure to the price of the precious metals, either by owning bullion or futures contracts. It's very important to understand that most ETFs/ETNs are not fully-backed by bullion. They are exposed to counter-party risk, which is why they are often referred to as "paper gold" or "paper silver". Don't think of owning them as the same thing as owning an equivalent $amount of bullion. The main reason to own an ETF/ETN is as a bet on where the price of the underlying metal is headed. If your time horizon for the bet is short, ETFs/ETNs can be the better choice: they're extremely liquid and they don't have the premiums and storage/shipping fees that come with buying physical bullion. The most heavily traded ETFs/ETNs are GLD and SLV, which are heavily stacked with futures contracts. For folks looking for funds fully-backed by bullion, Sprott offers PHYS (gold), PSLV (silver), and CEF (both); and VanEck Merk Gold Trust offers OUNZ, which has the additional option of converting your stake to physical bullion which it will ship to you upon demand. There are also an array of leveraged precious metals ETFs/ETNs for those really looking to take big risks on the price direction. Unless you are an experienced PM trader with discretionary capital to lose, stay away from these. Where do gold and silver come from? Mining companies dig them out of the ground. When the price of the precious metals rises, so do the prices of the companies that mine them. But the mining shares generally rise/drop much more than the price of the underlying metal. Because the miner is still sitting on ore in the ground. As the price of, say, gold goes up, not only is the gold the miner is selling today more valuable, but all of the ounces it will dig up in the future just became more valuable, too. So in this way, shares of stock in gold mining companies is said to be a leveraged play on the price of gold itself. Investors who think that gold is undervalued right now and positioned for a sharp bounce can buy shares of gold mining companies and expect to ride a much bigger wave higher if their prediction indeed comes true. But there's no guarantee of that. Mining shares introduce company risk (and many of them are run quite poorly). It's absolutely critical to understand that mining companies are EXTREMELY risky. And over the past decade, precious metal mining shares have been once of the worst-performing sectors of the market. They have been absolute widow-makers. Experts strongly advise that those investing in this space diversify, and do so by owning general indexes of mining companies (GDX is an example for the major mining companies, GDXJ offers an index of junior miners = even more risk! ), or by following the guidance of analysts who follow the space closely and do their best to identify the more promising/solvent companies from the riff-raff (Gold Newsletter and Gold Stock Analyst are two respected newsletters tracking these companies). While shares of individual precious metals mining companies can offer truly staggering returns in a gold bull market (e.g., in excess of 1,000%+), don't put any capital at risk in this space that you can't afford to lose. These are wildly risky. As you look at the spectrum of options for owning gold & silver covered by this primer, how do you decide how much (if any) of your capital to allocate to each level? The answer lies in clearly understanding your current financial situation, your future goals and needs and your risk tolerance. This is why we’re so adamant in encouraging investors to make the decision in partnership with their professional financial adviser (hopefully, one that doesn't sneer at the mere thought of owning a little gold!). Those having difficulty finding one can schedule a free consultation with the financial advisor endorsed by PeakProsperity.com. They have years of experience working with investors to answer the question: What percent of my portfolio does it make sense to hold in precious metals? So, why issue this primer now? As mentioned, I was at a conference recently where precious metals were a key topic. At that conference was Peter Schiff, who underscored the trap the Fed finds itself in. While nearly quintupling the money supply, through QE1, 2 and 3, the Fed promised us it would 'normalize' by selling off all of the assets it hoovered up from the market. But its recent capitulation has unveiled the lie -- the Fed can neither raise interest rates nor reduce its balance sheet without killing the economy. There will be no 'normalization'. From here on out, it's going to be ever more easy credit and ever more stimulus until the economy collapses under the weight of Too Much Debt. On that journey, the purchasing power of the US dollar is going to be destroyed. The best hope for the average investor is to own tangible assets that can't be inflated away. Gold & silver are the easiest for the average investor to access. But to benefit from the purchasing power protection of precious metals, you have to be positioned in them in advance of the coming fiat currency devaluation. If you're not well-positioned already, make it a near-term priority to become so. I'd mention that if you hold > $10,000 in aggregate in foreign accounts, then you have to file FBAR paperwork. So, buying bullion through HAA in Switzerland may seem like a good idea, but then you then fall under FBAR if you own more than $10,000 in aggregate in any overseas accounts. From my understanding, you can get away from FBAR reporting if you are the only person with access to the items in the account (like a safe deposit box). However, that is just one interpretation I've seen and of course isn't legal advice. Of note, the Feds won't let you slide easily if you don't report. You absolutely must know what you are doing if you're holding assets in foreign accounts. the Hard Assets Alliance differs from other OGSPs in that you don’t have to file an FBAR. That’s because your account is managed by a U.S.-based company. The only paperwork you have to contend with is reporting the sale on your Form 1040 Schedule B if you sell… and Hard Assets Alliance will send you a 1099 form in the mail to help you with that. But your general point is a good one to make folks aware of: most other storage solutions outside of the US will require the holder to file FBAR/FINCEN reports. Buying and holding gold for the long term is arguably sensible for the reasons mentioned but why would anyone buy a coin which is valued 10% or more above the spot price. Buying one or maybe half a dozen is a novelty but who in their right mind is going to buy $10,000 in gold coins physically worth $5000 to $9000. At the end of the day the coin market is just another retail business taking retail profits from vulnerable savers. It is also more prone to forgery than certified bullion (because it's simply easier and cheaper to forge 1toz of gold than it is a 1kg bar - though forgeries in the latter category are known). The bigger the bullion the less you get treated like someone buying jewelry and the closer you get to the spot price - by at least 2% because the bullion banks have to make a profit after all. Buy from bullion banks who test their gold and can demonstrate its integrity on the spot - ie. sellers who keep a working XRF and ultrasound scanner on the premises and can weigh your purchase on laboratory scales with 10mg precision. Or get them to do an accurate density test to verify it's not just tungsten. Don't forget, when you sell back your gold that the banks will want another 2% or 3% of the spot price. If you can buy and store gold at its spot price its probably too good to be true. In other words expect a minimum 5% loss on your original purchase, assuming the market value is flat. No wonder the bullion banks market themselves so aggressively - who gets a guaranteed 5% anywhere these days? As for silver the same rules apply but silver is an industrial metal, subject to corrosion and is even easier to forge. It's cheap and nasty for a reason. ...is also an industrial metal, as well as a precious metal ... and that's a strength, not a weakness. and is even easier to forge. It's cheap and nasty for a reason. While silver can be filled with lead, gold can be filled with tungsten. There is much, much more incentive to make fake gold than fake silver. Your only real protection with either metal is to make sure the company you are dealing with is an authorized dealer of a recognized governmental mint. Also worth noting : Silver is mostly mined as a byproduct of base metal mining. It is used up in making solar panels and other processes, and some goes into jewellery, investment coins etc. In times of economic collapse, base metal mining will also collapse, and silver will become unobtainium, unlike gold, all of which is still available above ground. We have much, much more gold in our hands than silver. What about BullionVault? Depending on quantity they have lower commissions than even GoldMoney! And 24/7 buying and selling on tight spreads, with instant settlement. great article...have to disagree about where you place the ETFs on the risk spectrum however. the Gold etfs are leverage over 300 to 1 in terms of physical gold to paper contracts sold....meaning there are over 300 claims on each 1 ounce of gold. don't expect to get any return on that investment at all...that is a house of cards ready to tumble. My uninformed interpretation of that second sentence is that even if your bank is a US bank, if the account is maintained (what does that word mean in this context?) outside of the US, then it's considered a foreign account. So, the question I have is would the account be maintained onshore here in the US (i.e. HAA is US company), or does maintain mean where the physical assets are held. The second sentence seems to indicate it's where the assets are held, i.e. Switzerland, Singapore, etc. as even if you have a US Bank, but your account is overseas, then it's subject to FBAR. Have the HAA lawyers issued an opinion on whether or not HAA accounts must be reported on FBAR? If so, can you share a link to their legal opinion on the matter? I pulled that quote straight from the FINCEN instruction form. I would like to believe that it's not required to be reported, but it's not worth the risk, IMO. P.S. I invest money into metalstream and was holding gold/silver in Singapore (not > $10,000 worth at any one time) but I have now changed that to be held in Utah. As a side note, I used to live in UT and they treat gold/silver on par with the US dollar in that you can pay your state taxes in gold/silver if you would be so foolish to do so. I liked a remark that, I believe Catherine Austin Fitts made: You should always have enough in your personal possession to bribe the border guard. Great article Adam! I like that you clarified the different options so well, and steered people away from numismatics. One clarification about delivery by HAA: they ship only to your address of record. You can change that of course, but you can't just have them ship to an arbitrary location. In response to pgp's comment about bullion: while I agree that you're getting a better price, it has its drawbacks. You generally can't carry it around with you, sew it into your clothes, hide it in small places, or bribe the border guard with it. You probably won't be using it for small transactions such as buying food or ammo if the price of gold jumps to $10,000 an oz (but who knows, maybe a loaf of bread will cost $1000). I.e. It's not as fungible as coins, IMHO. I have always wondered if I can purchase an $11,000 tractor with a bag of junk silver and pay sales tax on the face value of the silver. The Ninth Circus Court didn't like the idea so much. We have draft ‘orses, and all other 19th century farming wisdom and tools. Diesel as well as the diesel burners are available till... Diesel may be in short supply so I recommend ‘orses and a good miller, a tanner would be busy as well. I will sell you a 274 international with side dresser and cultivating equipment for 11k in junk silver.......don’t worry about the taxes. Two concerns that have stopped some people from buying PMs are the possibility of gov't confiscation (as was done in 1933) and/or new "windfall" taxes on your gains if the value skyrockets. Both of these worries can be neutralized by keeping your gold in a Roth account held by HAA in Zurich. This is especially viable if you are near retirement age. But your limit is $6500.00 per year, so buy while the price is on the low end. Assuming that you already have strong positions in food, fresh water supply, tools, medications, precious metals, etc. any thoughts on stockpiling ammunition? After the Sandy Hook shooting ammunition disappeared from store shelves almost immediately, presumably that could happen again. I live in an area with a strong gun culture (rural Michigan), so perhaps I have answered my own question. I am totally surounded by heavily armed people so I may not need much for defense, the area is probibly already saturated with ammunition, so perhaps little trade value. Perhaps "how much do you need to sleep well at night" is the metric. Best "storage" option is for the owner to have physical possession of his gold. It should be kept in a hidden safe, in a hole in the ground, or hidden somewhere.that only YOU know the location. This may sound "primitve" to those of you who think you are above actually physcially putting your hands on your assets and taking personal responsibility for them. If so, gold IMO is not for you. When you are talking about gold, you are talking about a safe, a loaded shotgun in the closet, and a big dog. Thats a certain level of personal security that I think people understood 80-90-100 years ago that many people today just cant wrap their heads around. "You mean I actually have to guard my own asset??" Its like "you mean I actually have to grown my own potatoes?". ecb: You make a good point on taxes/confiscation. Been playing the PM game for decades and many years ago long ago accepted that nothing will be safe when things start to unwind worldwide. Look at what happened in '31 or '08. All laws were subject to the "emergency". One's PM cannot be visible or international. It must be local and deniable. It's gotta be underground or "outside the system". This is problematic if you like silver in addition to gold (which I do) and have large holding (ditto). But it's doable, and the only way to be safe. This one is easy IMO: Reloading is pretty easy, inexpensive, and all you need to store is primers and powder. Just use airtight containers and keep backup with one's PM. 4" APS pipe is a good burial device (sand below/above for drainage/ease of winter access. Bury in muliple locations (think public land or private lots). Tell one trusted relative general info w/unlabeled, handwritten GPS in private papers (we will die). Bury with several nails/metal pieces above (metal detector traps/clues). Pass by sites at least yearly. Add $500 vaccum-packed cash to each site (retrieving in a crisis may involve complications. Bullion coins are easily tested for forgery using a scale & caliper (A Fisch is good yet expensive). Silver bars are a PIA to store but fit nicely into 2x4 walls (if you know sheetrock). Gold chains and rings are very liquid and the state has a hard time regulating them. Finding friends who want to buy/sell PM at spot price eliminates commission and is unrecorded. Buying PM with cash <$10k from a local dealer is private and can be done over years. If anyone has any other tips please add to the thread. I am a farmer and don’t take American Express, however will provide sustenance for junk. I'm honestly not very worried about confiscation. By US law the government can confiscate anything it wants in an emergency and if an emergency of massive magnitude happens they would start with bank accounts and move up the chain to savings/retirement accounts, safe deposit boxes etc. Physical gold not held in a safe deposit box is really hard to confiscate even if you know who owns it because you have to give a visit to each owner, then locate the owner's stash and to top it off the average person owns very little gold. Regardless, buying from a local dealer is not a lot safer than buying online. Most local gold dealers I've visited have cameras and they save the footage for a lengthy period of time (one told me indefinitely). Many even take a photo of your ID, especially if you sell. Some parking lots have cameras too and there may be license plate readers along the way. Your cell phone metadata can also show all places you've visited and how long you stayed there. However, if the government becomes truly desperate it can find gold holders who haven't made any online purchases by simply obtaining people's internet viewing habits from e.g. google. Basically you'll be caught if you've googled/read a lot of articles about gold or discussed gold online. Now, I don't think it'll get to it, because by the time they would come after your physical gold not held in a safety deposit box the government is likely too dysfunctional to obtain purchasing records from online gold dealers let alone trying to figure out all the people who likely own gold through physical dealership visits. In today's world we're subject to all sorts of monitoring that we don't even know about. We can do things to reduce it but it's wise to assume that nothing is as private as you would wish. Learn about ways to protect your privacy and start doing the things you can. Maybe leave your phone at home sometimes? I wouldn't be surprised if the unrelenting pressure of publicity on climate ( change) breakdown, such as the book: " The Unhabitable Earth ," soon seeps into the gold price. For a different disaster, story see on Amazon, Kate Brown's " Manual of Survival ", about the Chernobyl and nuclear testing fallout cover up. I seem to be partial to a good disaster. Thanks for the feedback (both public and private) on this primer, everyone. Glad to see it being so well-received. 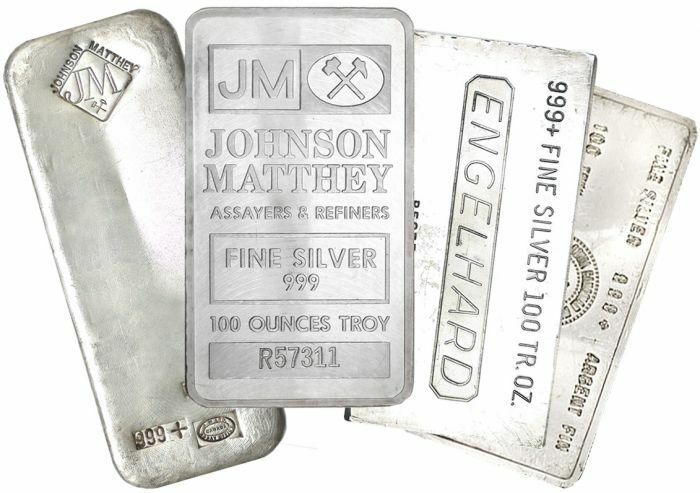 I've had several folks say this was 'just the resource they were looking for' to share with close friends & family who are novices when it comes to bullion, helping them understand how to navigate the purchasing process. I've even had a few bullion dealers ask if they can share it with new customers. That's been a pleasant surprise to hear! Sp if you have anyone in your life you know is trying to make sense of how to begin accumulating precious metals, feel free to send this to them. Many fear a full-blown currency crisis when gold/oil reserves would define national security. Confiscating private bank accounts make no sense here as the goverment can print worthless dollars at will (and does). But the US will likley become interested in PM horders (and PM leaving our shores). Unlike the 1933 gold confiscation we are no longer a net exporter with hard money pouring into our treasury. Today, as a net importer, gold is exiting and USD inflating. The US may seriously need hard assets to back the USD in the future. This may seem off-topic to this primer, but it's not. Why? Because PM is a liability (as defined by Kiyosaki). That is, it is expensive to buy/sell/hold, and generates zero income. The reason many pay this expense is currency insurance. So how one buys, stores, and sells it should be congruent with times of instability. BTW, other tip: 12. Ttrack off-grid PM holdings in Quicken using GLD/SLV ETFs, and buy/sell to keep one's % ownership constant...which forces one to buy low & sell high like dollar-cost-averaging (plus stay practiced at staying liquid). One can make good money over the years doing this while still holding the same % NW of PM. I just got off the phone with Hard Asset Alliance. I asked them whether I would receive specific information on the name/location of the vault in which my metals would be stored, and whether I would have a personal account number with them. My concern is having any layers or bureacracy between myself and the vault. I was told that the account is actually with HAA, and they open an account with the vault. If HAA becomes unreacheable (in a crisis perhaps), I would need to contact Gold Bullion International, the parent company, to retrieve my gold from the vault. So what makes this better than owning a gold-backed ETF such as PHYS, BAR, SGOL, AAAU, etc?